A guitar that's as fun as it is unique, there's a surprising amount of tonal flexibility to hand, too, which, if you ask us, makes the Sonoro a must-try. Excellent build. Looks fantastic. Great tones, particularly with slide. 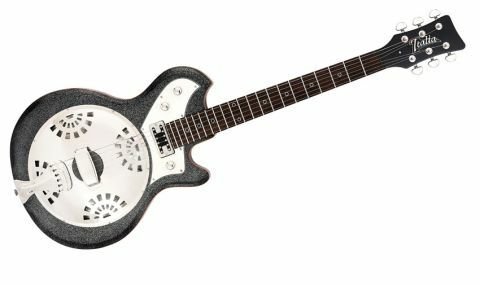 You don't see too many electro-resonators kicking around guitar shops these days, but if they all looked and played like the Italia Mondial Sonoro, we'd wager you'd see more. Dressed in seductive black and chrome with a slinky body and extra sparkles for good measure, this is a guitar that's so suggestive it practically winks at you. "As soon as you strum that first chord, the Sonoro sings"
Thankfully, the handsomeness is backed up. As soon as you strum that first chord, the Sonoro sings. Unplugged, it acts exactly as you want a resonator to, all honky and bluesy, and responds to heavy picking and alt-tuned fingerstyle with ease. Throw a slide into the mix and you're really cooking, a sensation that's helped by the slim size of the guitar, which makes you want to hop around a stage with it. Plugged in, you've got the benefit of a humbucker at the bridge (an Italia iTron) that's clearly meant to replicate the Fender Fideli'Trons found on Cabronitas in look and sound. It does a decent job, perhaps lacking some of the growl of the Fender variety, but you have extra tonal options thanks to an onboard piezo, which you can blend in via that lonely looking control nearest to the neck. The build quality on show here is superb, topped off by subtle details like the maple cap and circle fret markers that add to the palpable retro flavour.